1. Preheat the oven to 200°C, gas mark 6. Pod the beans to give about 250g. Cook in boiling water for 3-4 minutes, until just tender. Drain and place under cold running water until just cool enough to handle, then slip off their skins. 2. Put the beans, chopped garlic, lemon juice, vinegar, mint and oil in a large bowl, and mash, using a fork or potato masher, until coarsely crushed. Season. 3. Place the chorizo into a cold frying pan and warm over a high heat until the orange oils are released and the chorizo is starting to crisp at the edges. Rub the flatbreads with the remaining ½ clove of garlic, place on a baking sheet and drizzle with a little extra oil. Bake in the oven for 1-2 minutes until piping hot. 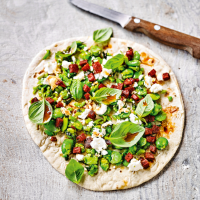 Top with the bean mixture, then scatter over the hot chorizo, feta and basil or pea shoots to serve.